Excess body fat is probably a cause of cancer of the gallbladder, a small pear-shaped organ connected to the liver. This is one of the reasons AICR recommends being as lean as possible within the healthy weight range. 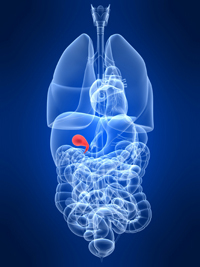 How Preventable is Gallbladder Cancer? AICR experts estimate that 22% of US gallbladder cancers are preventable through maintaining a healthy weight.